How long is God's wrath? Since it consists of seven bowls, does that mean it lasts seven days? Using insights from my book Know the Future, understand why the length of God's wrath is ten days and how to decode Revelation and understand it literally with the Old Testament Law. Revelation Roadmap Most Frequent Question? Howdy Tim, was wondering how you came up with a 10-day period for the 7 bowls of God's wrath? 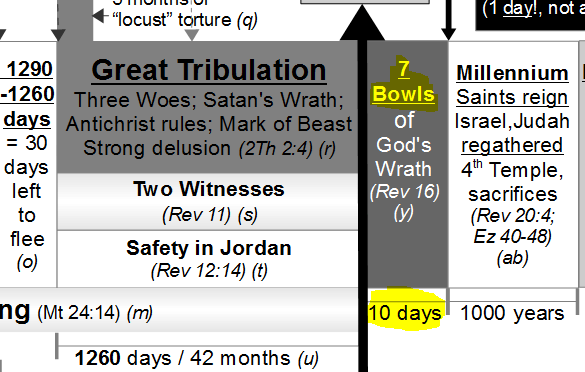 As you can see, the chart lists the 7 bowls of God's wrath from Revelation 16 as 10 days. Where do I get that? It's probably no surprise that no single verse gives the duration of God's wrath. If there was, the 10 days length would not just be taught by me but by many; the same as the 1000 years length of Jesus' reign in the Millennium is widely known. Without a verse stating it, proving the length of the wrath of God takes half a dozen steps to work out. This makes it a fine case study to demonstrate how to use the wisdom from Jesus' words to interpret Revelation literally. This article is going to give an abbreviated taste of the teachings of my book to show why the 7 bowls of God's wrath are 10 days long. Determining how long the 7 bowls last requires using the foundational keys for unsealing Bible prophecy taught in Know the Future. Revelation only makes sense if you take it as literally as the rest of the books of the Bible, rather than allegorizing it. The understanding that "Revelation is a symbolic book" facilitates making verses mean anything imaginable. This leads to the ditch of classic doctrines like amillennialism, preterism, pretribulation rapture, etc. These doctrines are all supported by an undisciplined, allegorical, spiritualized non-literal interpretation approach. Unfortunately this is the accepted norm in Christian culture. There is no "exegesis police" to lock away the false teachings that spring from non-literal interpretation. By the way, many prophecy teachers will say they take Scripture literally, but with Revelation this is not possible unless you understand how Revelation is sealed up or encoded. That's where the second piece of wisdom taught in my book comes in. It is the realization that to unseal Revelation you need to plug in the Old Testament Law, especially the holy days in Leviticus 23. This is not well-known because Christians mentally categorize the Law as a failed experiment to be ignored. This biases them against studying the Old Testament carefully. They also see the OT holy days as mere "Jewish holidays" with little relevance to Christians. Like most, they miss that Jesus, Paul and other NT writers gave a big reason to study the Torah. They said the Law "was a shadow" (Col 2:16-17) "good things to come" (Heb 10:1) and must be "fulfilled" (Mt 5:17-18). This tells us the Torah is just as much prophecy as books of the OT Prophets are. For example, the seventh day weekly Sabbath holy day is was not just a rest for ancient Israel after getting freed from slavery. 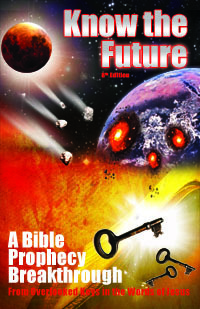 It is a prophecy that will be fulfilled by the 1000 year Millennium after 6000 years of man's self-rule. Each day of the week represents 1000 years in God's plan. Similarly, the annual holy day festivals in Leviticus 23 were not just holidays for ancient Israel. They are prophecies about events that would affect all mankind. That's why Passover and Pentecost had fulfillments in Jesus' first coming on the very day of the festival as the Gospels and Acts record. 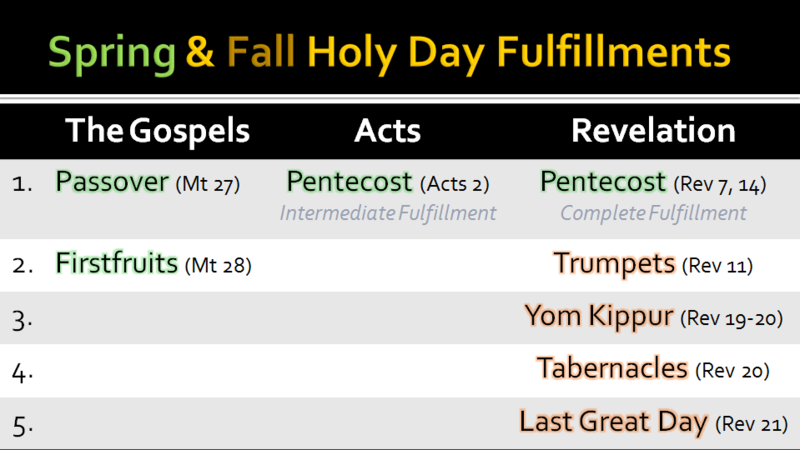 Likewise, Revelation records fulfillments of five of the seven annual holy days (including a second, fuller fulfillment of Pentecost as the chart below shows). To put it bluntly, Revelation cannot be made literal sense of unless you to know the prophecy festivals of Leviticus 23! Even armed with familiarity of the feasts of the LORD, the Book of Revelation is still closed if you don't pay attention to how to read and approach the volume. Many don't realize that there is a chronological narrative to Revelation that is interrupted by several parenthetical chapters. If you miss this you will get confused at every parenthetical chapter. Also, you'll be hard-pressed to solve Revelation in natural order from front to back. Instead, you have to find the easier to understand parts, wherever they are, and nail them down first. Just like how one approaches a jigsaw puzzle by doing the easy corner pieces first, then the intermediate border pieces and the hardest pieces in the center last. For figuring out God's wrath in Revelation 16, the end point (7th bowl) is much easier to identify than the beginning point (1st bowl, immediately following the 7th trumpet). Revelation 16 describes God's entire wrath delivered to earth in a series of 7 bowls starting with malignant sores and ending with a planet-leveling earthquake. To find out what happens next in the chronological narrative, don't continue on to Revelation 17. As the chart below shows, you have to skip forward over two parenthetical chapters. Jesus descends from Heaven with his glorified saints triumphantly on white horses (Rev 19:11-14). The Antichrist's armies melt in the presence of Jesus (Rev 19:15, 21=Zech 14:12). The Antichrist and False Prophet are tossed alive in the lake of fire (Rev 19:20). An angel escorts Satan to prison in the Abyss (Rev 20:1-3). The glorified saints with Jesus are given their thrones to rule from for 1000 year (Rev 20:4). One of these post-bowl events holds the key to identifying the exact day Jesus returns to reign. Most Christians are already familiar with how Jesus is represented in the OT holy days by the Passover lamb sacrifices. Meaning, when Jesus died on the very day of Passover, he fulfilled that type which had been rehearsed for centuries by Israel. Yet, few Christians realize that Satan also has an animal type in the OT which was rehearsed by ancient Israel. Leviticus 16 contains the instructions for the day of Yom Kippur, falling on Tishrei 10 (Tishrei is the 7th month of the calendar of Israel). God required the high priest take two goats, one for the LORD and one for Azazel (Lev 16:8). The LORD's goat is sacrificed on the altar. (Apparently as a type of Christ.) After that, the high priest lays his hands on the Azazel goat and confesses all the sins of Israel over it. What happens next is fascinating and mysterious. Rather than sacrifice the guilt-laden Azazel goat, God's instructions require an appointed man to take hold of it and bring it to a remote wilderness where it is left alone. What does it mean? The Law does not explain it and no Rabbi can tell you for sure. Revelation 20:1-3 (NIV2011) — 1 And I saw an angel coming down out of heaven, having the key to the Abyss and holding in his hand a great chain. 2 He seized the dragon, that ancient serpent, who is the devil, or Satan, and bound him for a thousand years. 3 He threw him into the Abyss, and locked and sealed it over him, to keep him from deceiving the nations anymore until the thousand years were ended. After that, he must be set free for a short time. It's the same thing as the Yom Kippur rehearsal. Clearly, Satan is the fulfillment of the Azazel goat; the angel is the fulfillment of the man taking escorting the goat to the wilderness which in turn pictures the Abyss that imprisons Satan. If Satan is banished in fulfillment of his Azazel type when Jesus returns, then this means that Jesus returns to reign on Yom Kippur, right at the end of the wrath of God. 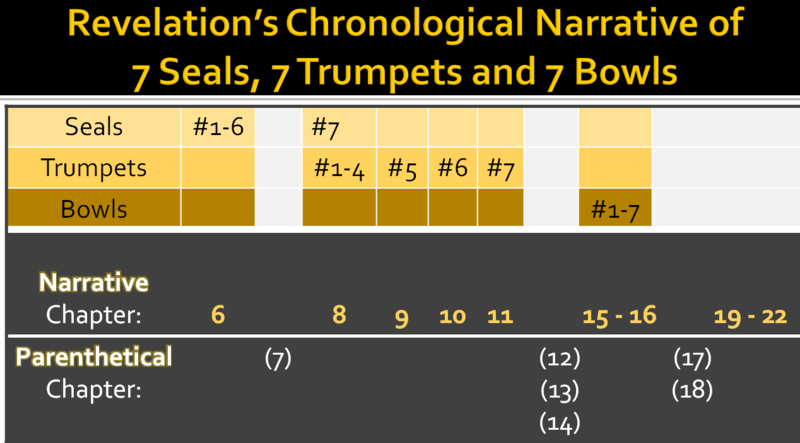 As the Revelation chapter chart above shows, to find the start of the 7 bowls, you have skip back over three parenthetical chapters (12, 13, 14) to get to Revelation 11 which speaks of the 7th trumpet. This is the start of the wrath because the seven bowl angels (who pour the bowls) first come out at the 7th trumpet (Rev 15:1). With the 7th trumpet, the prayer Jesus told his disciples to pray "Thy kingdom come..." finally is answered. The Kingdom of God comes to earth to reign with the first order of business being judgment. 1 Corinthians 15:51-52 (NIV2011) — 51 Listen, I tell you a mystery: We will not all sleep, but we will all be changed— 52 in a flash, in the twinkling of an eye, at the last trumpet. For the trumpet will sound, the dead will be raised imperishable, and we will be changed. Some object that Paul could not be referring to the 7th trumpet of Revelation with his "last trumpet" statement because Corinthians was written years before Revelation. However, this objection is silly for anyone who accepts the Bible as inspired by the Holy Spirit. The same Holy Spirit inspired every author of every book of the Bible, including John when he saw 7 trumpets and Paul when he understood the last trumpet. This is how this collection of 66 works by 40 authors works as a "unified message system," to use Hal Lindsey's description of the Bible. Putting these verses together as they rightly belong to be, the mystery of God is the resurrection of the dead in Christ at the 7th and last trumpet. 1 Thessalonians 4:15-17 (HCSB) — 15 For we say this to you by a revelation from the Lord: We who are still alive at the Lord’s coming will certainly have no advantage over those who have fallen asleep. 16 For the Lord Himself will descend from heaven with a shout, with the archangel’s voice, and with the trumpet of God, and the dead in Christ will rise first. 17 Then we who are still alive will be caught up together with them in the clouds to meet the Lord in the air and so we will always be with the Lord. Paul puts the rapture and first resurrection (Rev 20:5) at the same time. First the resurrection of the dead in Christ who rise to the sky. Then the "living in Christ" are glorified and rise to join them. That's the rapture. If you accept that the rapture is at the 7th trumpet of Revelation and you believe in a pretrib rapture, then at this point I have troubling news for you. The 7th trumpet is at the end of the Great Tribulation which starts at the 5th trumpet (not the 1st seal). This means, according to what Revelation literally says, the rapture comes post-tribulation, not pre-tribulation. Mark 13:24-27 = Mt 24:31 (HCSB) — 24 “But...after that tribulation...they will see the Son of Man coming in clouds with great power and glory. 27 He will send out the angels ["with a loud trumpet" - Mt 24:31] and gather His elect from the four winds, from the end of the earth to the end of the sky. Jesus is describing the same thing as Paul about him descending with angels and trumpets to gather the elect/saints (the NT uses elect for saints of all races, not just Jews). Jesus plainly says this gathering is "after the tribulation," exactly the point that the 7th trumpet arrives at. What day does all this happen on? The answer to that will tell us the day that the wrath of God starts. That's certain because Jesus taught that once the righteous are taken out, the wrath of God comes immediately after. He said the day of his coming would be "just like in the days of Noah and Lot" when judgment fell (on the world and Sodom, respectively) right after Noah and Lot were taken to safety (Lk 17:28-30). The big clue to what day the rapture happens and wrath begins is in how Paul said to both the Corinthians and Thessalonians that there is a "trumpet" sound associated with the resurrection (and by extension, rapture). This obviously steers us straight to the Day of Trumpets as the day of the rapture. Some claim other holy days also had trumpets so the Day of Trumpets is not clearly indicated by a trumpet sound. However, notice Paul also said there was "shouting" of the Lord and the "voice" of angels. This is important because of the original meaning of the Day of Trumpets. The Day of Trumpets Yom Teruah in Hebrew, or literally "day of shouting." It was re-interpreted and understood in Judaism in later years as "day of trumpets" because the verb teruah is also used as a verb for the "blasting" of trumpets. Which is right? They both are. It's a Day of Teruah or blasting, whether it be human voices or trumpets. Therefore, by mentioning trumpets and shouting, Paul covered both bases to identify beyond any doubt which day the rapture, resurrection and other 7th trumpet events happen on: Yom Teruah, the day of shouts or trumpet blasts. That's not all that lines the rapture up with Yom Teruah. Jesus also hinted that the rapture was on the Day of Trumpets when he said of the "after the tribulation" rapture timing, "of that day and hour knows no man" (Mt 24:36). The Day of Trumpets is known in Judaism as the day no man knows because if comes on the first day of the lunar month. The lunar month begins not at the astronomical new moon, but rather at the sighting of the new sliver of a crescent moon in the sky. Because the lunar cycle is 29.5 days on average, you have to watch for the crescent on the 29th day of the month to see whether the month ends that day or by default will end on the night of the 30th day. Tishrei 10 - Tishrei 1 = 9 Days? Of course, if you subtract the start from the end you get nine days, not ten. However, that is not using inclusive reckoning or counting the last day which is appropriate here. You see, the rapture happens as soon as the month of Tishrei begins with the sighting of the new moon crescent on the evening before the day. Remember that the start of the day in Biblical reckoning is with the evening just Genesis establishes in the first chapter of the Bible when it says "evening and morning were the first day" (Gen 1:5). The Battle of Armageddon on Yom Kippur does not appear to happen at night on the eve of its day like the rapture does. It appears to happen during the next day of the 10th because that's when the rehearsal of the Azazel goat was done and also when a battle is typically fought. 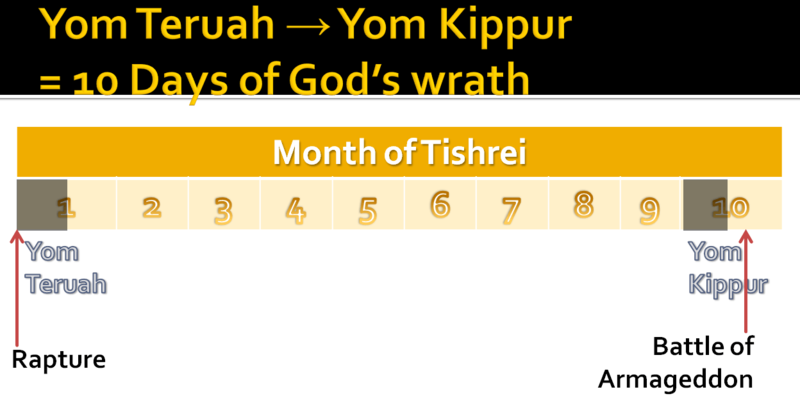 That means you count each one of the first ten days of Tishrei as the timeframe of the wrath of God. It starts with the nighttime rapture and ends with the daytime victory at Armageddon for a duration of ten days. That concludes this Know the Future study on proving 10 days of God's wrath, from Yom Teruah to Yom Kippur. What Wormwood (3rd trumpet) literally is at the 6th seal - 4th trumpet makes earth ripe for the taking by the Antichrist. If you liked this article, then you'll love the book it is based on. Please get Know the Future now to answer the questions above and many others. It will give you not only a deep understanding but also comfort about the end times. It can be thrilling as well.